These hamantaschen are a fun and unique crowd-pleaser that will surely have people going back for seconds and thirds. They have a golden pretzel exterior, everything-bagel spice topping and a smoky hot dog center. After all, what could be bad about fresh dough and hot dogs? Nothing. 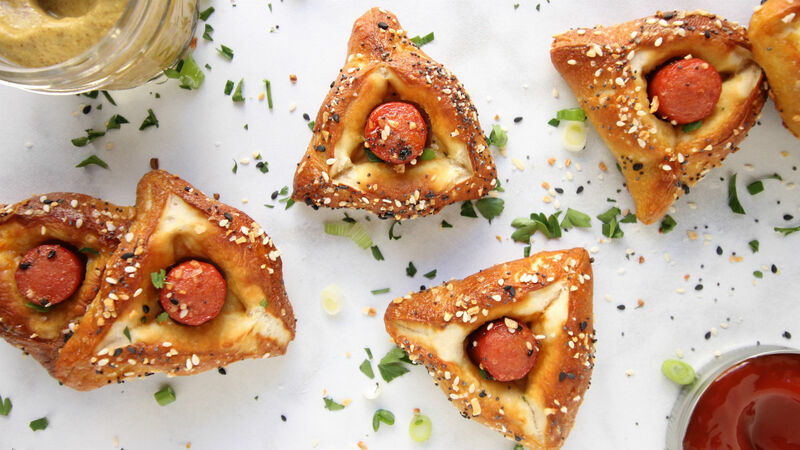 There are a few things to note about making these pretzel bagel dog hamantaschen to perfection. You must boil them: The only way to achieve that distinctive chewy texture and classic taste of a pretzel is with a baking soda and a boiling water bath. Be sure not to skip this part. Just a 10-second dip before baking is all it takes, and it makes a world of a difference. Pinch tightly: To ensure the hamantaschen hold their shape while baking, be sure to pinch the corners of the dough tightly. Keep the rise short: The dough requires only 15 minutes of rising time. Rising for longer will result in delicious, but more puffy hamantaschen. Wait to cut your hot dogs: Depending on the dimensions of your cookie cutter, you might end up having more or fewer than 40 hamantaschen. I recommend cutting the hot dogs after you have formed all of your hamantaschen. That way, you know exactly how many hot dog slices to cut. Everything topping: the everything topping is optional and you can either make your own, or buy some from Trader Joe’s. You could also try just adding sesame seeds, poppy seeds or dried garlic. To make the dough, whisk the 1 and 1/2 cups warm water with the yeast in a large bowl. Let it sit for about 3 minutes. Whisk in the salt, oil and sugar. Add in 3 cups of the flour, a little at a time, mixing until combined. Add 3/4 cups more flour. If the dough is still too sticky, add the last ¼ cup. Empty the dough onto your work surface and knead until smooth. Grease the inside of a medium bowl and transfer the dough to the bowl. Cover with a towel and place in a warm area for 15 minutes. In the meantime, make the baking soda bath. In a large, wide pot, combine the 9 cups of water with the baking soda and bring to a rolling boil. Working with half the dough at a time, lightly flour your surface and roll the dough out to ¼ inches thick. Use a 3-inch round cookie cutter to cut out circles. Tightly pinch three corners of each circle to form hamantaschen. Place the hamantaschen onto the prepared baking sheets. Using a large slotted spatula, drop 3-4 hamantaschen into the boiling baking soda water, making sure the tops of the hamantaschen are face down in the water. Boil for exactly 10 seconds. Any longer, and the pretzels will have a stronger pretzel taste. Remove with the spatula. The hamantaschen should be face down on the spatula, in order for the water to drain out. Place them back onto the prepared baking sheets, face up. Make sure they do not touch one another. 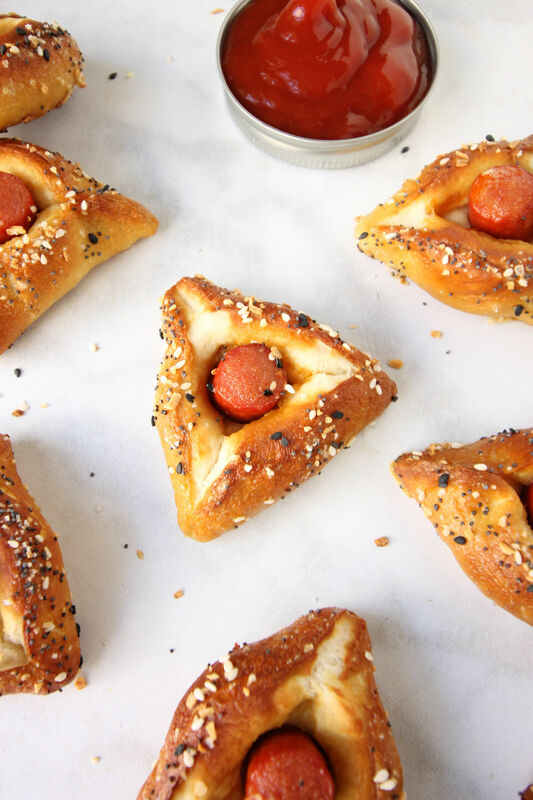 Place 1 hot dog piece into the center of each hamantaschen. Brush with egg and sprinkle with bagel seasoning. Bake for 15-20 minutes or until golden brown. Sprinkle with scallions and serve with ketchup and mustard.